Befitting a former leading lady of stage and screen, Glenda Jackson’s victory in the seat of Hampstead & Kilburn at the 2010 general election was one of the most dramatic results of the night. 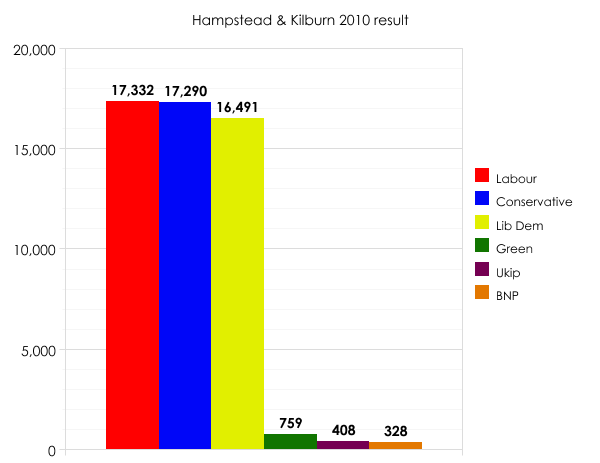 The result left Hampstead & Kilburn as Labour’s most marginal seat in the UK – and the most marginal seat held by any party in Great Britain*. The responsibility for defending such a tissue-thin majority in 2015 will fall not to Glenda Jackson, for she is retiring from parliament. Instead, Tulip Siddiq is Labour’s candidate: a former local councillor and sometime adviser to Ed Miliband and Tessa Jowell. For the Conservatives, Simon Marcus is hoping to inch past Siddiq and take what is his party’s number one target. For the Liberal Democrats, Maajid Nawaz – a man with a remarkable history, including spells in prison and audiences with George W Bush and Tony Blair – is hoping to outflank both the other two. He won’t manage it. I’m pretty sure Labour will be safe here, not because the Tories won’t put up a good fight, but because the Lib Dem vote will collapse. Enough of it will go to Labour to see the party retain first place, though some might also go to the Greens. Think of it as a sort of reversion to the norm, with Labour supporters who drifted away from the party in the noughties coming back after their flirtation with Nick Clegg in 2010. Such an outcome would have made for a rather fitting, final triumph for Glenda Jackson. Instead she is taking her final bow and, to detonate yet another cliche, leaving her audience wanting more. *The most marginal seat in the UK being Fermanagh & South Tyrone.